Nisan 15: Wednesday sunset to Thursday sunset. The Day of Preparation when thousands of Paschal lambs are slaughtered ready for the following day’s (i.e. Thursday evening’s) Passover. Jesus instructs his disciples on the arrangements he has made for the feast. Nisan 16: a. Thursday evening: Jesus celebrates Passover. b. Thursday evening and night: Jesus is arrested and tried. d. Friday 15.00: Jesus dies. Nisan 17: a. Friday ‘evening’: The start of the Sabbath: Jesus is buried by Joseph of Arimathea. b. Friday evening to Saturday sunset: Jesus body lies in the sealed tomb. Nisan 18: Saturday sunset to ‘early’ Sunday: The body remains in the tomb overnight(?) but by early next morning is missing. John’s timeline, however, is markedly different. He says that Jesus is arrested on the Day of Preparation for Passover – that’s Nisan 15 according to the synoptics, which started at sunset on Wednesday (John 13.1; 19.14.) In John, therefore, Jesus does not eat a Passover meal with his disciples. He shares an ordinary supper with them on the Wednesday evening, when he washes their feet. Judas slips out to inform on him just as he does in the synoptic gospels, a day later (Mark 14.16-17; Matthew 26.19-20; Luke 22.33-45.) John significantly alters the timing of events though he retains Judas leaving, though from a different meal. In the fourth gospel, Jesus is arrested on the Wednesday evening, the start of Nisan 15. John mentions in 18.28 that the temple officials involved in the arrest have yet to eat their Passover meal; it still awaits on Thursday evening. In John, Jesus is tried during the night of Nisan 15, or the early hours of Thursday. Eventually, at around noon on the Thursday he is nailed to the cross and dies rapidly (John 19.14, 31, 42). By the time everyone else is eating the Passover meal later that day – a meal Jesus is present for in the synoptic gospels – John’s Jesus is well and truly dead. He is placed in Joseph of Arimathea’s tomb at some point Thursday evening, either the end of Nisan 15 or the start of Nisan 16. He remains there during Friday and Saturday (the Sabbath) but by Sunday morning his body, according to the story, is missing. It has been argued – given we don’t know the year Jesus was crucified – that John has his Passover falling on the Saturday, the Sabbath (John 19.31), as happened on occasion, and that therefore John’s ‘Day of Passover Preparation’ was not the Thursday – as it is in the synoptics – but the Friday. According to this line of reasoning, Jesus’ arrest in John was also on Thursday evening, at the start of Nisan 16 and his crucifixion was on Friday, as in the synoptic gospels. But the Day of Passover Preparation cannot be freely moved around to accommodate both versions of events; either it was on the Thursday (Nisan 15) as the synoptics record, or it was on the Friday (Nisan 16) as those who seek to locate John’s crucifixion on Friday argue. Either John is wrong about when the Day of Passover Preparation fell or his Jesus was crucified a day earlier than in the synoptics on their Day of Preparation, Nisan 15. There is further circumstantial evidence for John’s crucifixion being on the Thursday. While the synoptics have the chief priests, scribes and elders witnessing the crucifixion for themselves, John doesn’t mention their presence. In his Thursday scenario, they are too busy preparing for that evening’s Passover, overseeing the ritual slaughter of thousand of animals, to attend the crucifixion. Similarly, the various activities after Jesus dies – the buying of linen and spices, the removal of the body from the cross, the preparation for burial, sundry visits to Pilate and the posting of guards (though John does not report the latter.) – do not entail any infringement of the Sabbath regulations. Nisan 17: Jesus remains in the tomb throughout Nisan 17; 6pm Friday to 6pm Saturday. As well as a resurrection ‘on the third day’, John’s version of events provides an added bonus. By having his crucifixion on the Day of Passover Preparation, John is able to draw an analogy between the slaughter of the sacrificial lambs and his ‘Lamb of God’ who, in his death, replaces them as an atonement offering. The effort to harmonise the two different timelines, that of the synoptics and that of John, involves having two different Days of Passover Preparation (Thursday and Friday) and indeed, two Passovers (Friday and Saturday). Does this seem likely to you? Two lots of lambs to be slaughtered and two celebrations on two consecutive days – I mean, these people weren’t made of money! Isn’t it far more likely there was one Day of Preparation and one Passover? If so, who is right about when they fell? 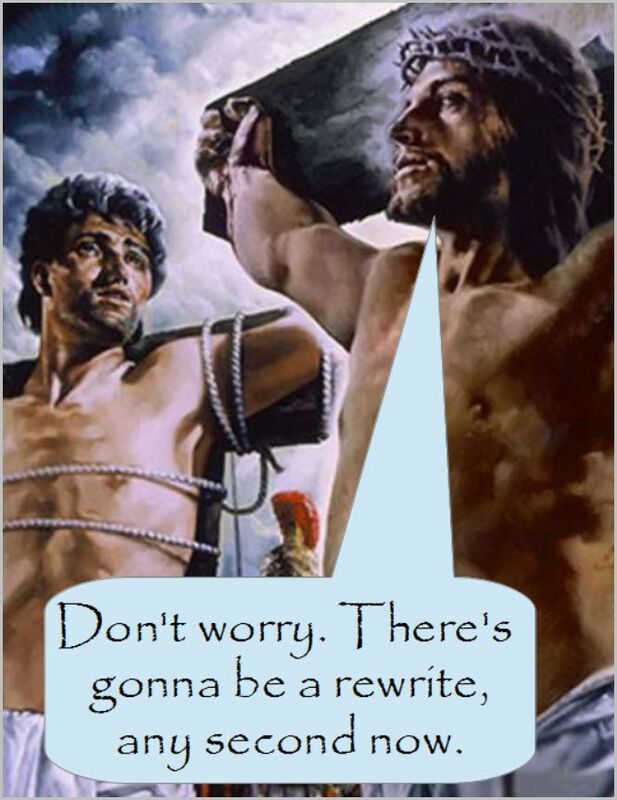 John or the synoptic writers? They both can’t be. Whether apologists like it or not, isn’t it more likely that the fourth gospel has Jesus crucified on the same Day of Preparation that the synoptics mention (the Thursday), while in the synoptics – all based, let’s remember, on Mark’s account – he dies on the Friday after the Passover meal as they relate? It makes more sense of the conflicting timelines than attempting to mash them both together when they won’t. One or other, John or the synoptics, got it wrong about the day Jesus died; perhaps both did. One thing’s for sure, what follows is pure unadulterated myth. How do we know he didn’t say them? Lots of reasons. Firstly, they’re not in the other three gospels all of which were written earlier than John’s, and are therefore closer to the time Jesus lived (though the earliest, Mark’s gospel, was probably put together thirty to forty years after Jesus lived.) 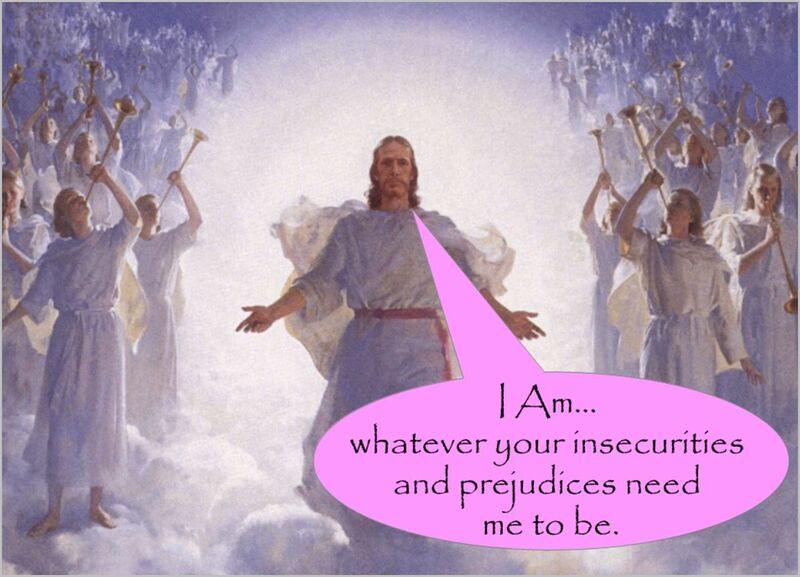 If Jesus had really made all those grand ‘I am’ claims, wouldn’t the other gospel writers have recorded them too? Yet none of them mentions even one. Secondly, in the synoptic gospels – Matthew, Mark and Luke – Jesus has a different message from the one given to him in John’s gospel. The earlier gospels have Jesus talk about himself only very rarely. Instead, he goes on at length about the coming of the Kingdom of God (or Heaven) and how y’all better get ready for it ’cause it’s a-coming soon. Was he wrong about that one! On the odd occasion he does refer to himself in the synoptic gospels, he often does it in a sort of coded way, calling himself ‘the son of man’. He hardly ever uses ‘I’, let alone makes grandiose claims about himself. Thirdly, all three of the synoptic gospels rely on earlier sources, now lost to us, and none of those has Jesus make ‘I am’ statements either. How do we know? Because, again, they’re not there in any of the three accounts – Matthew, Mark or Luke – that are built up from them. Significantly, one of these sources is an early record of Jesus’ sayings; that’s a ‘sayings gospel’ that doesn’t relate any ‘I am’ sayings. Fourthly, John’s gospel is late – at least sixty years after JC’s death and also after Paul’s supernatural Christianity had gained a foothold among the gullible. The Jesus of John’s gospel is a reworked version, more in-line with the ‘Christ’ that Paul preached and much less like the Jewish peasant who had lived and preached the Kingdom of God. Despite what Christians claim, John’s gospel is not another eye-witness report (none of the gospels is) that differs only in minor details from the other three accounts. It is total reworking of the story, with its central figure transformed into a sort of divine Superman, and the idea of the coming Kingdom relegated to a single mention. This change of agenda renders the fourth gospel utterly unreliable as an historical record of anything the earthly Jesus might have said. Fifthly, Christians claim John’s gospel differs from the others because in it Jesus reveals special, secret truths about himself to ‘the disciple whom he loved’, traditionally the John whom the gospel is named after. But again, the problem with this explanation is that the synoptic gospels don’t mention Jesus favouring one particular disciple over the others (unless it’s Simon Peter). In these, John, a loud, brash fisherman, plays only a minor role. Why don’t the synoptics refer to the special, more intimate relationship that John’s gospel refers to? Largely because there wasn’t one – not until the fourth gospel came to be written and ‘John’, who led the community that produced it, wanted to bump up his part. So, idiotic as it would have been for an itinerant Jewish preacher and ‘prophet’, whose mission ended in failure, to make these claims about himself, Jesus never did. He didn’t say he was ‘the Way, the Truth and the Life’. Or ‘the Vine’. Or ‘the Good Shepherd’. These are claims made for him long after he lived, by people who were persuaded by a snake-oil salesman that a God-man had mystically ‘saved’ them. They ‘re-imagined’ Jesus, sayings and all, to fit their idea of what he must have been like – and John’s gospel was born. Ever see the film Multiplicity starring Michael Keaton as Doug, a man who clones multiple copies of himself? There’s a perfectionist Doug, a slob Doug, a macho Doug, a gay Doug, a romantic Doug… you get the picture. If you haven’t seen the film, you should. Or you could read the Bible for much the same experience. It’s the original Mulitiplicity, with Jesus as the Michael Keaton character. There’s a Jewish Messiah Jesus, a demanding zealot Jesus, a Greek god-man Jesus, an intangible spirit Jesus and, just like in the movie, having so many clones about leads only to trouble and hilarious consequences. Well, maybe not so much the hilarious consequences, but certainly trouble. Christians really have time for only one these Biblical Jesuses, the superhero creation of ‘Saint’ Paul’s who goes by the name – the title, no less – of ‘the Christ.’ This Greek god-man makes few demands of his adherents – he does everything for them – and provides them with a free-pass to Heaven (though Paul neglects to mention this particular super-power – you’ll search in vain for promises of Heaven in Paul’s writing.) Supernatural Christ Jesus always proves a better option than the earthy Jesus of the synoptic gospels because ‘gaining a right standing with God’ is a far easier game to play than serving others. Synoptic Gospel Jesus preaches the coming of the God’s kingdom on Earth in the first century; tells his followers they should sell all they have to give to the poor; commands them to love their enemies and pray for those who persecute them. He insists they should lend without expectation of any return, cut off body parts that offend them and attend to the log in their own eye rather the speck in their neighbours’. No wonder Christians have no time for Gospel Jesus! He’s far too demanding, far too radical, like the super-perfectionist Doug in the film. Oh, they’ll protest they really do believe in Gospel Jesus, but if they did, we would see them doing all the things he tells them they should. And we don’t. The demanding, Gospel Jesus loses out too to Ephemeral Mystic Jesus, the Jesus found in John’s gospel, the one who just can’t stop talking about himself. Then there’s Avenging King Jesus of the psychedelic nightmare that is Revelation. He’s the one who’s going to come back to Earth at some point (allegedly) to massacre his enemies. 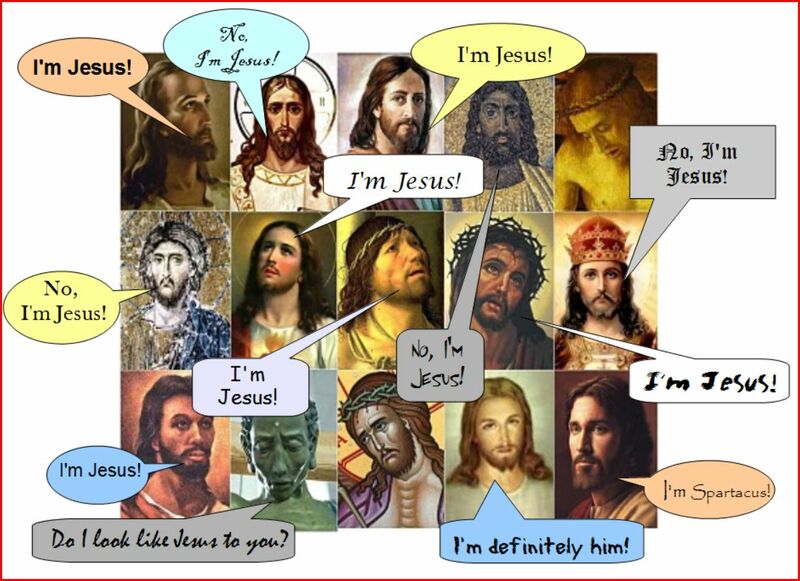 It’s impossible to tell which of the multiple Jesuses is the ‘real’ one. Maybe it’s none of those in the Bible – move over Christ Jesus, Gospel Jesus, Mystic Jesus, Avenging King Jesus; the only Jesus Christians are really interested in is the one of their own making. The one they say lives in their hearts and who once, apparently, lived in mine. This is the best Jesus of all because he can be whatever you want him to be. Maybe, in the end though, none of the Jesuses, not even the one Christians imagine lives inside them, is real. They’re all just imaginative interpretations of a long-dead, charismatic zealot whose mission went badly awry. And if the Bible hasn’t got a grip on what its central figure is really all about – Jewish Messiah, Greek Christ, intangible spirit – then what else is it confused and wrong about?